Myrtle Beach is a favorite family destination as it is 60 miles of clean brown sand that is the tourist hotspot of South Carolina. With multiple amusement parks and water sports parks surrounding the area Myrtle Beach has plenty of family friendly fun. Jetskiing and deep sea fishing are also available and having many malls and over 100 golf courses for family members who like shopping and water sports. If you are not at the beach there is still plenty to do like go to the Ripley’s Aquarium or take part in some medieval themed dinner theatre. Here is also the home of one of the top 15 Boardwalks in the United States. For the more sports enthused there is also a minor league baseball team and the formerly known NASCAR Speedpark which has been now named the Broadway Grand Prix which offers multiple go cart tracks for families who like a little action. Consider the possibility that renting a hotel the entire time might be more expensive than reserving a vacation rental home property as with large groups the cost of many rooms can add up. Plus the kitchen gives the option to do stay at home dining which will also save money. As with any destination that has a tourist centre you will find current specials put on by the city to attract more visitors. By taking advantage of free coupons to enter parks and other discounts that are available you can save a lot of money. If watersports are not your thing then visiting during the low season will see a variety of discounts as hotel competition is high during the offseason. Room rates at this time will be much easier to find in your budget. Seasonal holiday events are also another good reason to visit during the offseason. 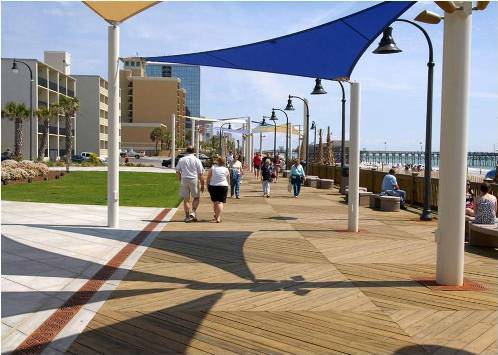 As a way to revitalized the downtown core the Myrtle Beach Oceanfront Boardwalk and Promenade was constructed in 2010. Spanning 1.2 miles down a beautiful ocean front this boardwalk hosts many of the carnivals and whose path is laden with unique shops and stripmalls. In the eventime things cool off and start to get really interesting with the various jugglers and acrobats doing performances alongside musicians and other artists doing performances down the boardwalk. Myrtle Beach is a great spot for families and can be a cheap option when deciding on a beach vacation. Compact enough that you can walk to almost anywhere you want to go. And having a great amount of option makes this place a good option for a family getaway.